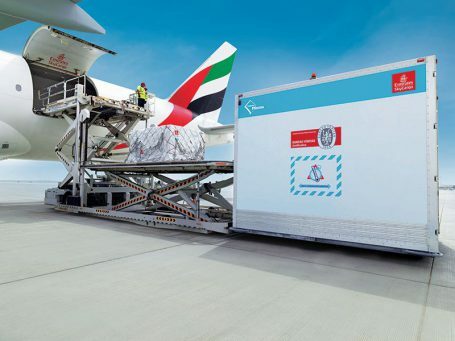 Emirates SkyCargo, the freight division of Emirates, has stepped up its commitment to securely transport temperature sensitive pharmaceutical shipments with the introduction of pharma corridors offering additional protection across selected stations in its network for pharmaceutical cargo. Watch a video of how pharma cargo transits through Emirates SkyCargo’s hub in Dubai. The first 12 stations in Emirates SkyCargo’s pharma corridors are spread across three continents and include Amsterdam, Brussels, Bengaluru, Cairo, Dublin, Dusseldorf, Hong Kong, Luxembourg, Milan, Rome, Shanghai and Singapore. The rollout of pharma corridors was led by pharma specialists in the Emirates SkyCargo team working in coordination with cargo service delivery teams and ground handlers locally at stations. In addition to enhanced training provided to staff handling pharmaceutical cargo at the stations, the team also undertook a number of engagement and qualification visits in order to prepare for the rollout. Further cities are expected to be added over the course of the year. Emirates SkyCargo’s pharma corridors enhance its Emirates Pharma air transportation solution. The air cargo carrier has also invested in developing White Cover thermal blankets in addition to innovative containers such as the Emirates SkyCargo Cool Dolly or the White Container to guarantee that lifesaving medicines travelling through its network are not compromised. Emirates SkyCargo has a fleet of over 50 cool dollies dedicated to pharma cargo. The carrier also works with leading container rental services across the globe to ensure that customers have the widest choice of products and solutions to meet their requirements. Emirates SkyCargo operates to over 155 destinations across six continents and operates a fleet of over 265 aircraft including 14 freighters.